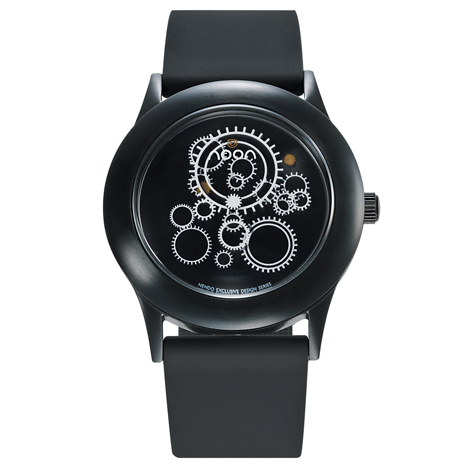 Dezeen Watch Store: new in at Dezeen Watch Store this week is Dark Noon by Japanese designers Nendo for Danish brand Noon. Each watch in the collection tells time in its own unique way. Gear (above), tells time using a collection of gears that rotate around each other as time passes. Times (above) features a set of 12 smaller clock faces which replace the traditional numbers on the face. The time is displayed via a traditional minute hand and a floating, truncated hour hand that moves around the smaller clock faces. Line uses two dotted lines to represent the hands of the timepiece, one marking the hour and the other the minutes. Every hour when the hands align, the dots line up to make one complete straight line. The Dark Noon collection is available to buy online or over the phone. The collection is also available at our Dezeen Super Store pop-up shop at 38 Monmouth St, Seven Dials, London, WC2H 9EP. Get 10% discount in store and enter our competition to win a designer watch worth £150 by downloading this flyer and presenting it at the shop. Nendo is included in our book, Dezeen Book of Ideas. Buy it now for just £12.